Incumbent Sixth District Representative, Hon. 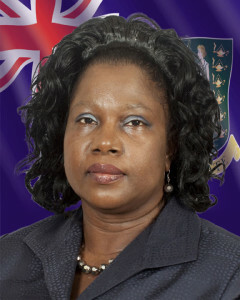 Alvera Maduro-Caines stated that she has grown accustomed to insults from various political opponents. The Sixth District incumbent representative lashed out at one of her opponents who she said announced that she has done nothing for the District. She said that as a first time Representative she refurbished the home of a Purcell resident, and made significant strides in addressing the water woes in the area. The representative mentioned that the Water and Sewerage Department is now erecting a small building to house the pump that will push water up to the residents of Free Bottom Hill. “I have signed off on the contract to erect a retaining wall in the vicinity of Brook’s residence in Purcell, to prevent land erosion and road hazards,” she added. “I know some folks tend to think that retaining walls are personal, but when you weigh the balance between saving lives and doing nothing then value is pale in comparison. Contracts were also signed to pave the parking lot for the burial ground in Johnson Ghut,” the incumbent stated. She refuted claims that she did nothing during her term by stating that she completed road works in the residential area of Johnson Ghut, created a beautiful garden and placed shaded benches in the area as well. She also mentioned that shaded benches were also placed in Belle Vue and Baugher’s Bay.